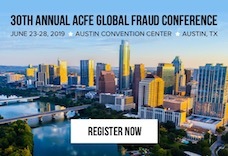 I eagerly anticipated my second ACFE Global Fraud Conference, knowing this one would be different because this year I'd be attending as a student representative. When we finally landed in Nashville, Tennessee, home of country music venues including the Grand Ole Opry and the Ryman Auditorium, I was met by bands rocking every bar on the Honky Tonk Highway (Broadway Street) and hapless bachelorettes staggering from bar to bar or pedaling down the street on “Nashville’s #1 Party Bikes!” Nashville was definitely hopping and as I observed the debauchery I had to ponder: was this preparing me for a taste of my next four years of college life? After hearing some of the points — unclear objectives, misaligned priorities, personal conflict — Price and Chafin outlined five key elements of an effective cross-functional investigations team. Thick skin and confidence. Those are just two of the skills the first-ever women’s panel offered female anti-fraud professionals during yesterday’s session at the ACFE Global Fraud Conference. Cynthia Cooper, CFE, CEO of Cooper Group, moderated a panel of five women representing public, private, government and corporate worlds.